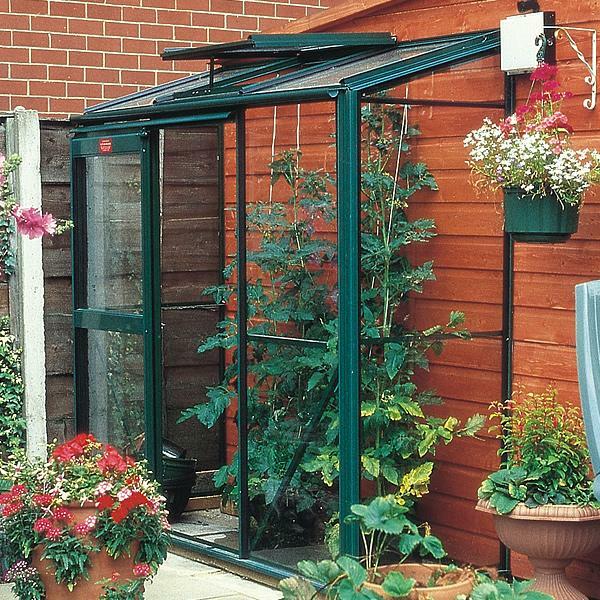 Choice of lengths from 4'4" to 12'5"
The Elite Easigrow lean-to greenhouse is a mini lean-to greenhouse built to accommodate reduced space requirements without compromising quality or purpose. Standard features of the the Easigrow include built in gutter, fingertip sliding door/s and a roof vent. On the 4ft 4in and 6ft 4in models, a single door is supplied. On models 8ft 5in and above, a double door is supplied. This greenhouse has an optional 5 inch aluminium base plinth, which removes the need for it to be fitted to a brick base. As with all of our aluminium greenhouses, this building will be delivered directly to you by one of our own careful drivers. We always like to ensure that your building reaches you in perfect condition, so at point of order we will always ask you to provide us with as much information regarding access to your address and base area as possible. We will always give good notice of our expected arrival date and work carefully with our customers to try and provide a suitable time and date to suit you. If you cannot be there in person, we will endeavour to leave the greenhouse pack in a pre-designated area, we simply require you to inform us of the area and ensure that it is safe and stable enough for the glass and greenhouse pack to be left. As our aluminium greenhouses are so popular, the delivery times can vary from season to season. Our colour powder-coated greenhouses can take slightly longer, due to the powder-coating process. For plain aluminium greenhouses, you should expect to receive your building in around 3-4 weeks from point of order and up to 6-10 weeks for certain colours. Please feel free to contact us on 0800 999 0123 to check our current delivery times.